Often subacute in onset, but may be life-threatening if improperly managed. Early neurosurgical consultation is of critical importance. A 19-year-old white man noted the gradual onset of severe left frontal headache. The headache was sharp and constant, interfered with sleep, and was not relieved by asparin. Two weeks after the onset of the headache, the teen was noted to have a grand mal seizure associated with urinary incontinence that lasted 15 minutes. On admission to hospital, he was afebrile and alert, but somewhat confused. He was oriented to person, but not to time or place. Examination of the head, ears, nose, and throat showed teeth in poor repair, with evidence of several cavities and gingivitis. Fundoscopic exam revealed sharp disc margins. Mild left-sided weakness was noted on neurologic exam. A computed tomography scan with contrast demonstrated a 3-cm, ring-enhancing lesion in the right frontal cortex. No evidence of sinusitis. Symptoms are initially nonspecific, and a delay in diagnosis is common (2 weeks). Severe headache is often localized to the site where the abscess has formed. Neck stiffness noted in occipital brain abscess or after rupture into the ventricle. Alterations in mental status, inattentiveness, lethargy, coma (a bad prognostic sign) may be seen. Vomiting is associated with increased pressure in the cerebrospinal fluid. Fever not present in half of patients. Focal neurologic findings appear late. Papilledema, a late manifestation, seen in 25% of cases. Deficits in the Vlth and lllrd cranial nerves result from increased cerebrospinal fluid pressure. Seizures most common in association with frontal brain abscess. Brain abscess is an uncommon disease, found in about 1 in 10,000 general hospital admissions. Infection of the cerebral cortex can result from the direct spread of bacteria from another focus of infection (accounts for 20% to 60% of cases) or from hematogenous seeding. Subacute and chronic otitis media and mastoiditis (spread to the inferior temporal lobe and cerebellum). Frontal or ethmoid sinusitis (spread to the frontal lobes). Dental infection (usually spreads to the frontal lobes). The brain abscess in Case 4 likely originated from a dental focus. Brain abscess as a complication of ear infection has decreased in frequency, especially in developed countries. By contrast, brain abscess arising from a sinus infection remains an important consideration in adults and children alike. Bullet wounds to the brain devitalize tissue and may leave fragments of metal that can serve as a focus for infection. Other missiles that have been associated with brain abscesses are pencil-tip injury to the eye and a lawn dart. In such cases, brain abscess may develop many years after the injury. Brain abscess can occasionally result from facial trauma or as a complication of a neurosurgical procedure. The development of brain abscess after neurosurgery may be delayed, with symptomatic infection occurring 3 to 15 months after the surgery. Abscess location can befrontal or temporal, frontoparietal, parietal, cerebellar,and occipital. Cerebritis (acute inflammation and edema) progresses to necrosis, followed by fibrotic capsule formation. Chronic pulmonary infections such as lung abscess and empyema, often in hosts with bronchiectasis or cystic fibrosis. Esophageal dilation and endoscopic sclerosis of esophageal varices. Bacterial endocarditis (2% to 4% of cases). Cyanotic congenital heart diseases (most common in children). No primary site or underlying condition can be identified in 20% to 40% of patients with brain abscess. The location of a brain abscess reflects the site of the primary infection. In order of decreasing frequency, abscesses are most commonly found in the frontal or temporal, frontoparietal, parietal, cerebellar, and occipital lobes. The histologic changes in the brain depend on the duration of infection. Early lesions (first 1 to 2 weeks) are poorly demarcated and are associated with localized edema. Acute inflammation is evident, but not tissue necrosis. This early stage is commonly called cerebritis. After 2 to 3 weeks, necrosis and liquefaction occur, and a fibrotic capsule surrounds the lesion. 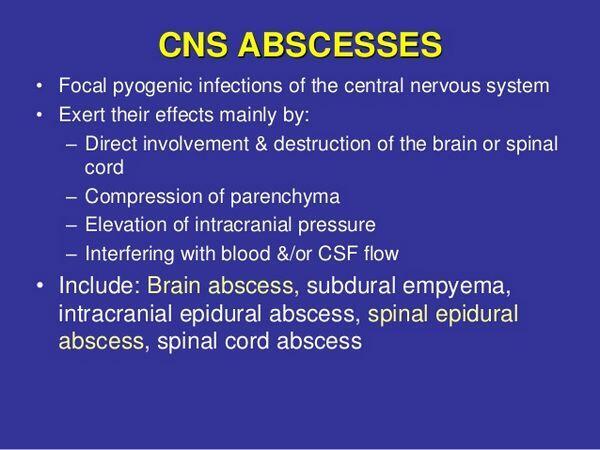 The bacterial causes of brain abscess are highly variable. The pathogens involved vary depending on the site of the primary infection, the age of the patient (microorganisms often differ in children and adults), and the immune status of the host. The organism or organisms recovered from a brain abscess frequently provide clues about the primary site of infection and any potentially undiagnosed underlying conditions in the host. Anaerobic bacteria are common constituents of brain abscesses, generally originating as part of the normal mouth flora. However, intra-abdominal or pelvic infections can occasionally lead to bacteremia with an anaerobic organism that seeds the cerebral cortex. The anaerobes in such cases usually reflect colonic or female genital tract flora. The anaerobes most frequently cultured from brain abscesses include anaerobic streptococci, Bacteroides species (including B. fragilis), Prevotella melaninogenka, Propionibacterium, Fusobacterium, Eubacterium, Veillonella, and Actinomyces. Aerobic gram-positive cocci are also frequently encountered, including S. viridans, S. milleri, microa-erophilic streptococci, S. pneumoniae (rare), and S. aureus. S. aureus is a more frequent pathogen in brain abscess following trauma or a neurosurgical procedure. S. milleri is particularly common, and this organism possesses proteolytic enzymes that predispose to necrosis of tissue and formation of abscesses. Aerobic gram-negative rods are not usually recovered in brain abscess except following neurosurgery or head trauma. When gram-negative rods are isolated, E. coli, Pseudomonas, Klebsiella, and Proteus species are most common. Rarer gram-negative rods include H. aphrophilus, Actinobacillus actinomycetemcomitans, Salmonella, and Enterobacter species. In the immunocompromised patient, the range of organisms — particularly opportunistic pathogens — is considerably broader. Toxoplasma gondii can reactivate when the cell-mediated immune system becomes compromised. Nocardia asteroides, a common soil organism, can enter the bloodstream via the lungs and seed the cerebral cortex. Aspergillus, Cryptococcus neoformans, and Coccid-ioides immitis also can enter through the lungs and subsequently invade the cerebral cortex. Other pathogens causing brain abscess in the immunocompromised host include Candida albicans, mucormycosis (Zygomyces), Cladosporium trichoides, and Curvularia species. Individuals infected with HIV frequently develop infections of the cerebral cortex. Toxoplasma gondii is the most common cause of brain abscess in these patients, but more than one Central nervous system infection can occur simultaneously. Tuberculomas, cryptococcomas, early progressive multifocal leukoencephalopathy and infection with L. monocytogenes, Salmonella, Candida, Histoplasma, and Aspergillus have all been reported to cause Central nervous system lesions in association with HIV infection. In the patient with AIDS, Central nervous system lymphoma also commonly mimics brain abscess . Gram-negative rods (Escherichia coli, Pseudom onas, Klebsiella, Proteus) are rare. Haemophilus aphrophilus, Actinobacillus actinomycetemcomitans, Salmonella and Enterobacter are rarer. Cysticercosis parasite a possibility in immigrants. Parasites are the most common cause of brain abscess in individuals who have previously lived outside the United States. Cysticercosis represents 85% of brain infections in Mexico City. Other parasites that can cause brain abscess include Entamoeba histolytica, Schistosoma japonicum, and Paragonimus species. Changes in mental status are common. In patients with frontal abscess, subtle disturbances in judgment and inat-tentiveness may be the primary symptom. Lethargy can progress to coma, and these changes are thought be primarily the consequence of cerebral edema and increased intracranial pressure. The development of coma is associated with a poor prognosis. Vomiting may also develop as a consequence of increased intracranial pressure. The absence of fever does not exclude a diagnosis of brain abscess. A significant percentage of patients with the disease (45% to 50%) fail to mount a febrile response. Focal neurologic deficits usually develop days to weeks after the onset of headache and are observed in half of patients at the time of admission. The specific neurologic deficits depend on the location of the abscess. Palsies as a consequence of increased intracranial pressure on the Vlth and Illrd cranial nerve may be seen. Papilledema is a late manifestation of increased intracranial pressure and is found in 25% of patients. As observed in case 6.4, focal or grand mal seizures develop in 25% of patients and are most commonly associated with frontal lobe brain abscess. Focal symptoms (for example, unilateral headache) or signs (for example, unilateral cranial nerve deficits, hemiparesis) and papilledema suggest a space-occupying lesion in the cerebral cortex. In this circumstance, a lumbar puncture is contraindicated until this possibility is excluded. The asymmetric cerebral edema associated with brain abscess can cause brain stem herniation in 15% to 30% of patients if cerebrospinal fluid pressure is reduced below the tentorium by lumbar puncture. A computed tomography or MPJ scan with contrast should be performed before lumbar puncture to exclude a focal cerebral lesion. Blood samples for culture should be drawn (positive in 15% of cases), and empiric parenteral antibiotic therapy initiated before the computed tomography or magnetic resonance imaging scan. If the study is negative, the lumbar puncture can then be performed. Early cerebritis. The lesion appears as an irregular area of low density that does not enhance following contrast injection. Later cerebritis. The lesion enlarges and demonstrates a thick diffuse ring of enhancement following contrast injection. The ring of contrast enhancement represents breakdown of the blood-brain barrier and development of an inflammatory capsule. Late cerebritis. Necrosis often develops with late cerebritis. Pre-contrast images reveal a ring of higher density than the surrounding edematous brain. Injection of contrast demonstrates a thin ring that is not of uniform in thickness. Healed abscess. Once the abscess has healed, the resulting collagen capsule becomes isodense (same density as the surrounding tissue), and infusion of contrast no longer results in ring enhancement. is more sensitive for detecting early cerebritis. is more sensitive for detecting satellite lesions and is capable of detecting smaller-diameter lesions (1-mm resolution). more accurately estimates the extent of central necrosis, ring enhancement, and cerebral edema. As noted earlier in this chapter, lumbar puncture is con-traindicated in patients with brain abscess because of the danger of herniation. When this test has been performed inadvertently, the cerebrospinal profile is indicative of a parameningeal infection — that is, moderate numbers of White blood cells (fewer than 500), usually with a predominance of mononuclear cells; normal cerebrospinal fluid glucose; and normal cerebrospinal fluid protein. On rare occasions, an abscess may rupture into the lateral ventricle, causing frank meningitis and a resulting cerebrospinal fluid formula with a predominance of polymorphonuclear leukocytes (up to 160,000/mm3), low glucose, and high protein. The goals of therapy are to sterilize the abscess or abscesses and reduce the mass effect caused by necrosis and cerebral edema. Because surgical drainage of the brain abscess is usually necessary, a neurosurgeon should be contacted as soon as the diagnosis is made. To cure brain abscess, prolonged intravenous antibiotic therapy (6 to 8 weeks) is required. A number of drugs can be chosen depending upon the probable pathogen or pathogens. Once the causative organisms have been isolated and susceptibility testing performed, the drug regimen can be modified. High-dose penicillin remains the mainstay of therapy when a dental origin is suspected. Penicillin covers all mouth flora, including aerobic and anaerobic streptococci. Metronidazole is also recommended for most patients, because this antibiotic readily penetrates brain abscesses; intralesional concentrations reach 40 µg/mL. Focal symptoms or neurologic signs plus papilledema suggest the possibilty of a space-occupying lesion; lumbar puncture is contraindicated. After blood culture and empiric antibiotics, perform computed tomography or magnetic resonance imaging scan with contrast. An magnetic resonance imaging is preferred over computed tomography scan (detects early cerebritis and smaller lesions, and visualizes the brainstem). Early cerebritis (edema, no ring enhancement). Later cerebritis (ring enhancement with early capsule,edema). Late cerebritis (necrosis, ring seen without contrast, thin, non-uniform contrast-enhancing ring). Healed abscess (no longer ring-enhancing, lesion becomes isodense). This drug has excellent cidal activity against all anaerobes, but is not active against aerobic organisms. In most patients, a third-generation cephalosporin should also be included in the regimen to cover Enterobacteri-aceae that may be present, particularly in patients with a brain abscess associated with a chronic ear infection. High-dose ceftriaxone or cefotaxime are equally effective and should be used unless Pseudomonas aeruginosa is strongly suspected. When P. aeruginosa is cultured, or when a brain abscess develops following a neurosurgical procedure, maximum doses of ceftazidime or cefepime should be used. In patients who develop brain abscess following a penetrating head trauma or craniotomy and in the patient with S. aureus bacteremia, high-dose oxacillin or nafcillin needs to be included. Aminoglyco-sides, erythromycin, tetracyclines, and first-generation cephalosporins should not be used to treat brain abscess, because these drugs do not cross the blood-brain barrier. Surgical drainage is generally required for both diagnosis and treatment. Needle aspiration is preferred in most cases, because this procedure reduces the extent of neurologic damage. In patients with a traumatic brain abscess, an open procedure is preferred to remove bone chips and foreign material. Surgical removal of the entire capsule greatly increases the likelihood of cure in fungal brain abscesses. In patients with early cerebritis without evidence of cerebral necrosis, and in patients with abscesses located in vital regions of the brain inaccessible to aspiration, surgery can be delayed or avoided. When a decision is made not to drain immediately, careful follow-up with sequential computed tomography or magnetic resonance imaging scans is critical. Following the initiation of empiric antibiotics for an established brain abscess, indications for surgical intervention include lack of clinical improvement within a week, depressed sensorium, signs of increased intracra-nial pressure, multiloculated abscess, abscess size exceeding 2.5 cm, and progressive increase in the ring diameter of the abscess. Contrast enhancement at the site of the abscess may persist for several months, and so that finding is not helpful for deciding on surgical intervention or continued antibiotic therapy. Glucocorticoids should be given only to patients with evidence of mass effect and a depressed mental status. If used, intravenous dexamethasone should be administered at a loading dose of 10 mg, followed by 4 mg every 6 hours. The drug should be discontinued as soon as possible. The addition of glucocorticoids has several disadvantages. These agents reduce contrast enhancement on computed tomography scan, making changes in abscess size more difficult to monitor. Glucocorticoids also slow capsule formation (increase the risk of ventricular rupture), and reduce antibiotic penetration into the abscess by improving the integrity of the blood-brain barrier. metronidazole (concentrates in abscesses and kills all anaerobes). ceftriaxone or cefotaxime (covers gram-positive and gram-negative aerobes). If Pseudomonas is a possibility, substitute ceftazidime or cefepime. Nafcillin or oxacillin (for abscess following head trauma, neurosurgery, or Staphylococ-cus aureus bacteremia). Use vancomycin if methicillin-resistant S. aureus is suspected. Neurosurgery usually required for culture and drainage. Always consult a neurosurgeon. Needle aspiration is usually preferred (less collateral damage). Open resection is recommended after head trauma and with fungal abscess. Use observation in cases of early cerebritis, with frequent follow-up imaging (computed tomography or magnetic resonance). reduces contrast enhancement during imaging. slows capsule formation and increases the risk of ventricular rupture. reduces antibiotic penetration into the abscess. rupture of the abscess into the ventricle (80% to 100% mortality). Surviving patients experience a high incidence of neurologic sequelae (30% to 60%), recurrent seizures being the most common. This persistent problem most frequently follows frontal brain abscess.